Tom Price is an avowed supporter of cutting Medicare — one of the most popular government programs in the United States. His name adorns legislation that would repeal Medicaid expansion and shunt many with preexisting conditions into high-risk pools — two of the least popular ideas in the Obamacare-replacement debate. 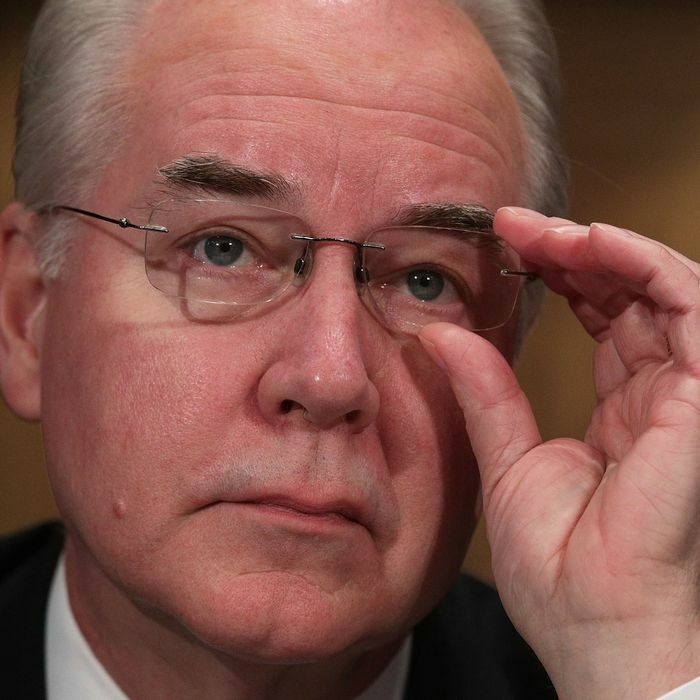 When he isn’t drafting widely despised health-care proposals, Price likes to buy the stocks of medical companies that would benefit from his bills. In March 2016, Price bought $15,000 worth of stock in Zimmer Biomet, a medical device company. Two days later, the congressman introduced a bill that would have protected that company from a cut in its Medicare reimbursement rate. Zimmer Biomet then put money in his campaign coffers. Last summer, Price made a bulk purchase of discounted shares in Innate Immuno, an Australian biotechnology company. Shortly thereafter, he helped push through legislation that expedites the FDA’s approval process — a reform that directly benefits Innate Immuno, which is working to get its wares onto the U.S. market. Price has already enjoyed a 400 percent paper gain on his investment in the company. So, it at least looks like Price lied to Congress … which is a federal crime. None of this stopped the Senate from putting Price in charge of the Health Department: In a 52-to-47, party-line vote early Friday morning, the upper chamber confirmed the former doctor as head of Health and Human Services. You could paint this as a conservative triumph, a testament to Republican unity and Democratic impudence: Trump nominated a Health secretary with deeply unpopular ideas about health care and an apparent insider-trading scandal — who couldn’t get through his confirmation hearings without (ostensibly) committing perjury — and the GOP still got the president his man. But read that sentence again and ask yourself: Who benefits from the new Republican Health Secretary’s being an opponent of Medicare who’s mired in allegations of corruption? As Vox’s Matt Yglesias has noted, it’s not clear how it’s in the GOP’s interest to rubber-stamp Trump’s most unqualified and deeply compromised nominees. There are plenty of Republicans who support school vouchers and quasi-theocratic rule. Surely, some of them also know the basics of education policy, and can get through a confirmation hearing without saying the words “potential grizzlies.” Betsy DeVos is going to be the voice of the Trump administration on matters of education. And she’s bad at public speaking. Beyond the fact that she paid top dollar for the gig, it’s hard to see why Republicans would want her to be Education Secretary. Likewise, it’s difficult to see why Trump would want Tom Price to be the face of Republican health care — and, thus, of Obamacare repeal. This week, Republican senator Mike Lee said that it would be harder for his party to repeal the health-care law if they “load down” the bill “with what comes next” — ostensibly because, once you get into the details of the GOP’s replacement plans, repealing Obamacare becomes markedly less popular. But elevating Price makes it more difficult for Republicans to hide the ball. The Health Secretary’s own replacement plan is the most detailed — and politically toxic — on Capitol Hill. Price’s approach to health care makes Paul Ryan’s look like Bernie Sanders’s: While Ryan merely wants to reduce federal funding for Medicaid expansion, Price’s bill eliminates it entirely; and while Ryan wants to toss those with preexisting conditions into high-risk pools with an annual subsidy of $25 billion, Price thinks those pools can get by with $3 billion. For Democrats, the ideal narrative about Obamacare repeal goes something like this: The Republicans are coming for Medicaid recipients and cancer patients today — and then for Medicare enrollees tomorrow — all so that they can cut taxes on themselves and their filthy rich donors. By confirming Tom Price — an enemy of Medicare and Medicaid, who pushed health-care policies that would directly increase his own net worth — Republicans have given Democrats the perfect villain for their story.